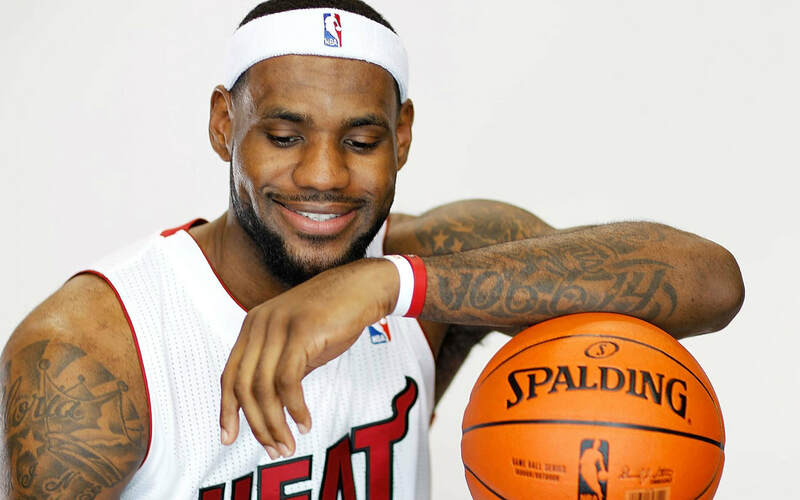 The first breathe stats on Lebron James are as follows----born at 4:04 PM in Akron, Ohio on December 30, 1984. He's a Cappie Sun Star---so he'll better with age. That's the blessing of having Saturn rule your Star Sign. I'm very eager to take a peek not only at Lebron's blessings as given by the stars at his birth. But, I'll be taking a look at his present choices, his numeric stats, and what might lie ahead. I thought it interesting when I heard a spokesman refer to his opt out with the Cavs to join the Lakers as a 'chess move'. It's interesting, because, when you know that the planet Uranus' demands freedom as one of its positive influences, and that Mercury rules contracts. It no wonder that Lebron's own Mercury Uranus fire conjunction at birth encourages him to be a 'free agent'. 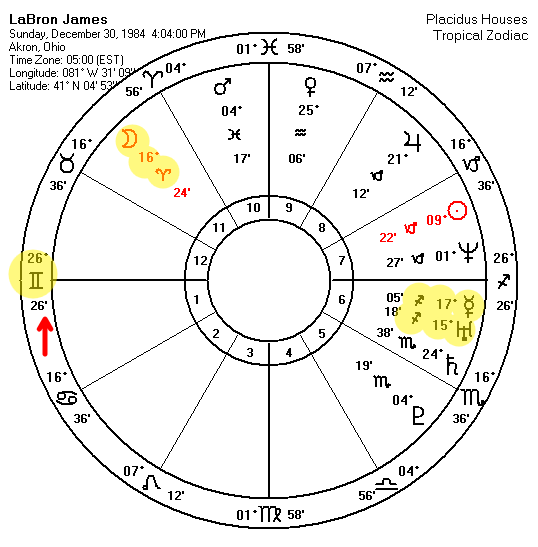 This Mercury Uranus conjunction is emphasized by its Trine to his fire Moon, so it's clear nobody will ever own Labron James. This planetary blessing also also allows him to be well tuned into his own instincts/moon. when he was born. It's always my goal to show how each of us has been divinely given the numeric magic that will shape our life by way of our stars. Here just one of Labron's star parallels. At the 4:04 PM on December 30, 1984 in Akron, Ohio the astrological sign of Gemini was rising at the 26th degree. If we add the numbers 26° to 60°, which is where Gemini begins in the 360° circle, we get the sum number of 086°. 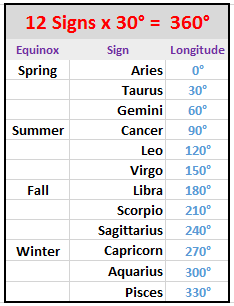 So Lebron's rising sign can be expressed as either 26° Gemini or 086° of total celestial longitude. The NBA reports that Lebron stands 6 feet and 8 inches tall. Fun right? Its interesting because if he was born 4 minutes earlier, or 4 minutes later that rising sign would be either 25° or 27° which would be expressed as either 085° or 087°. The image to the left shows how the constellations are measured against the ecliptic. You already know we use the Geographical Coordinate System to locate items on Earth. We use the Celestial Coordinate System to track the orbit of the planets around the Sun. The JPL (Jet Propulsion Labortories of NASA) calculates these measurements so they can figure out a trip to Mars. It should be no wonder why Steph Curry can hit 3 pointers from anywhere when you know his date of birth, 3/14, aligns with the 3.14 Pi---Ah, the Great Circles! Not only do the stars Tick like our clocks. But they point into directions when we flip them 90 degrees off the ecliptic and project them against the terrain. Our methods are a spin off of whats traditionally known in Astrology as Local Space popularized by Micheal Erlewine in the 1970's; however, the ancient Chinese have been mapping the stars over the terrain doing it for centuries as a part of Fung Shui. 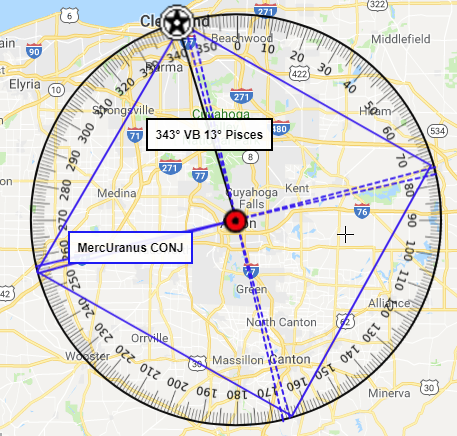 Lebron James Mercury Uranus Square show Vector to Cleveland from Akron. Akron, Ohio (red target) with a vector (black line) of 343° heading to Cleveland (white star). The Blue lines in this illustration show his own Mercury Uranus conjunction forming a Square (90°) angle/aspect against the compass, and how one of those 90° angles are aligning into the direction of Cleveland Ohio ----and only off by a 2° orb. 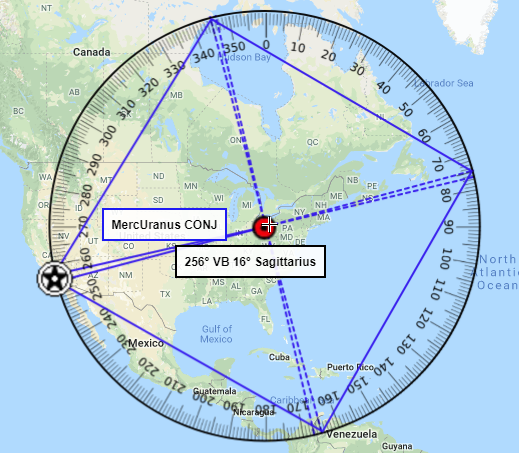 Lebron's Mercury Uranus conjunction measure 15 and 17 degrees of Sagittarius and heading are heading rigth to LA. This 256° vector to LA is also energized by his natal Moon in Trine to a Mercury Uranus conjunction. I'm left to conclude that being a Laker may have always been the universe's plan for Lebron James. It will be interesting to see what happens next for him at this location in terms of his Career. When I peek at this man's stars, my gut tells me he's gonna make a big splash there is LA very quickly and decide to retire in about 3 years---he has the two planets, Venus and Mars, by progression, moving into new signs and they we will transverse that sign over the next 20 to 30 years. That sign is Aries. So, I think we will get 3 more really great years of basketball from him before he decides he wants to do something new, something big, something that will also have a lot of energy around it ---maybe build a structure of sorts---something with a hospital keeps popping up for me about that----maybe I'm looking to long at his Mars in Pisces in perfect Trine to Pluto----maybe he'll tear something down to rebuild it better, stronger and he'll gladly place his name upon it. The letters that make up the word LONGITUDE can be rearranged into ​​​UNTIE GOLD. 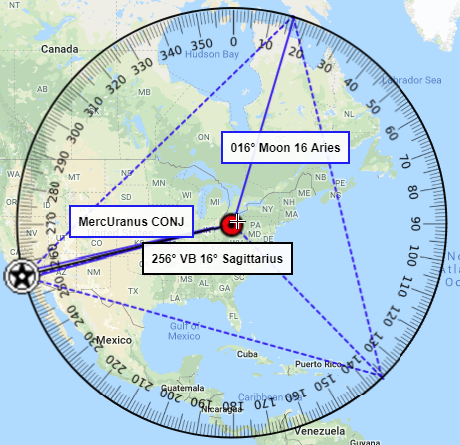 That's what Bet The Stars also likes to do with the measuring longitude of people birth stars ----we like ​​TO INDULGE---that is another anagram of the word LONGITUDE ---we like to measure the planets positions along the ecliptic to see how they parallel to the numeric values in the persons' life events. Below are Lebron's numbers and how they've played out so far. You can click the image to enlarge it. But let's talk Jersey number. His progressed Ascendant at the time of this team change is 23 degrees of Cancer, so it's no surprise he'll keep his Jersey number 23. I'll continue to watch his game and see what other measurements of his star foretell his stats, and will update it along his journey. In the meantime, want to see your Star Number Grid?